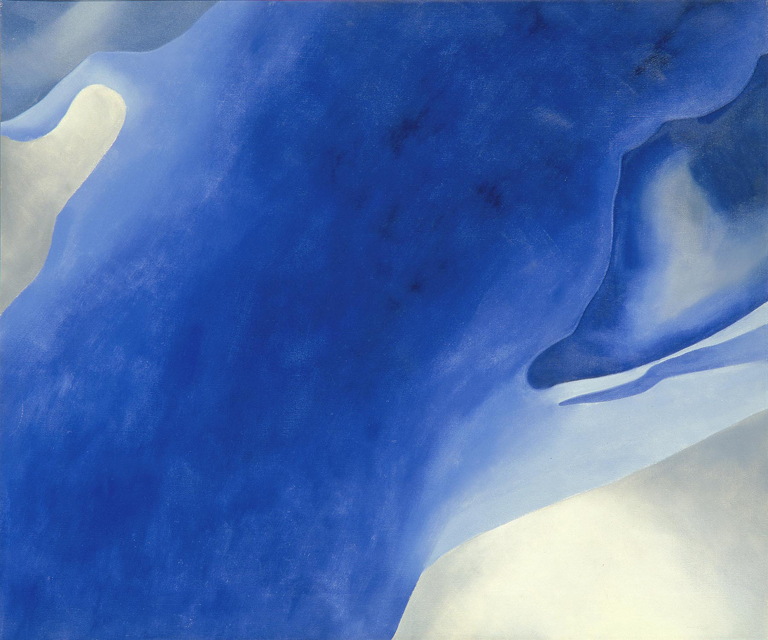 Georgia O'Keeffe, Blue B, 1959. Oil on canvas. Milwaukee Art Museum. Gift of Mrs. Harry Lynde Bradley. Photo credit Larry Sanders. ©2010 Georgia O'Keeffe Museum / Artists Rights Society (ARS), New York. Why do we have art in our lives? What are the intentions of artists? Even when they write down what they were up to, is it okay to disagree with what they say about their work, or should that be where we stop? What role does our personal interpretation play in a work of art? What happens when artists give up their work to the world? And after they do so can (or should) they have a say over how people feel about it? I often find that these sorts of deep conversations–those that touch on life just as much as art history–happen in the galleries. It seems easier to grapple with life’s big questions when a work of art is the bridge, even if the questions are never ultimately answered. And I often think that while I know my students are learning a lot about artists, the creation of art, history, and about themselves in the teen programs, what I always come away with, every single session, is how much I myself learn from them. That night, I got home, collapsed on the couch, and switched on Project Runway’s “Behind the Seams” special, hosted by Tim Gunn, the show’s mentor. (Don’t judge. You know you love Project Runway too.) On the show, Tim helps the designers through each episode, supporting them and challenging them, with the grace and care of a professional educator–which, in fact, he is: he was a professor at Parsons The New School for Design for 24 years before Project Runway ever began. Then–I’m not going to lie–I cried a little too. What Tim said is exactly how I feel about teaching in the galleries. The teens, and every group I work with here at the Museum–from kindergartners on a school tour, to teachers in a professional development workshop, to our volunteer docents–give me so much. They help me understand the work in the Museum Collection, but more than that, they illuminate art in ways that help me think about the world and life itself. Tim says the designers give him hope “for the future of [the fashion] industry.” I know this is cheesy, but for me every teen, student, visitor, teacher, and docent I speak with in the galleries gives me hope for the future of the world itself. You never know what the seeds planted by the comments and ideas from a gallery teaching session will grow into–just look at where the Satellite teen program alums have gone. That’s why I love gallery teaching. In a time when we are all so busy, juggling homework and SATs or a full inbox and countless obligations, a museum gallery is an oasis where works of art connect us to the world and to each other. This entry was posted in Education and tagged Museum education, Satellite High School Program, Teen Programs. Bookmark the permalink.